In the beautiful St. Lawrence River valley you’ll encounter a city that stands majestically against a backdrop of sky and water. With a spectacular medieval city wall, and château that rises dramatically over vibrant blue skyline, you may think that you are in Europe. In fact, you’ve arrived at Québec City, one of the oldest cities in North America. 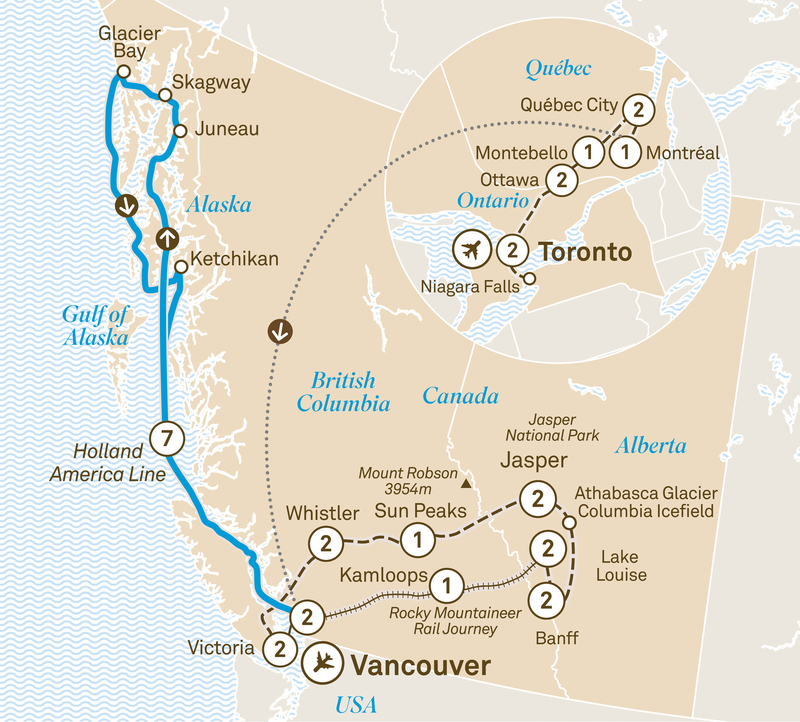 It’s just one of the highlights of this itinerary, which will take you from modern Toronto to alpine resorts like Whistler. You’ll see the emerald gem that is Lake Louise, the quaint gold rush town of Skagway, and Juneau, Alaska’s capital city, a settlement so isolated it can only be accessed by sea or air. By the time your journey ends, you may think that it was all a very beautiful dream. Fly to Vancouver for an exclusive two night stay at the Fairmont Hotel Vancouver (flight not included in land only tour price). Celebrate tonight with a ‘Welcome to Western Canada’ dinner.